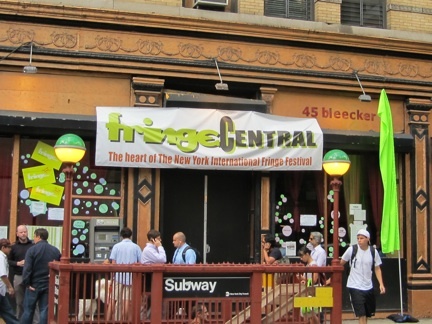 It’s the first day of the 15th annual New York International Fringe Festival, and already the air around 45 Bleecker Street (FringeCENTRAL) is thick with buzz. With over 200 shows from around the world performing up to six times between August 12 to 28, it’s physically impossible to see everything, so the intrepid Fringer must keep ears and eyes alert for overheard comments, unsolicited recommendations, patter from Fringe artists, and colorful posters and postcards that have already begun to proliferate the East Village like voracious tendrils of kudzu. Navigating the Byzantine program guide requires the mental gymnastics of a Sherlock Holmes and the future sight of a Nostradamus. How does one decipher the intention behind descriptors such as “Sometimes you have to meet a ‘Material Girl’ to appreciate ‘America’s Sweetheart’” (Donna/Madonna), “Our motivational seminar/rock opera will teach you to attain Hawkman” (The Power of the Crystals), “A hilarious Greek tragedy/Shakespearean drama/rock musical where everyone’s named Jan” (Greg Kotis’ already sold-out Yeast Nation)? With Fringe you never quite know what you’re getting until the lights go down—and sometimes not even after they’ve come back up again. So why Fringe at all? What’s the appeal of a festival that seems as much designed to baffle the squares as to champion emerging artists and premiere new works? A long-time aficionado of Fringe, both as participant and patron, I like to equate its bounty as more of a cornucopia than a crapshoot. A world-wide phenomenon, Fringe festivals have taken root on every continent save Antarctica, and serve to introduce regional theater artists to an international audience as well as a platform for small companies with ambitions to propel themselves forward and upward. A successful Fringe run often leads directly to future success (Kotis being just one example, with his massively popular musical Urinetown), having already generated some press and cultivated an audience during it. Many groups that get their start in the Fringe, honing their craft on broken-shoestring budgets, go on to establish themselves permanently in the theatrical firmament. Others disappear into the obscurity where they were first formed. It’s a bit of a crapshoot after all, but one that simply can’t be dismissed. No lover of New York City theater ought to pass up the opportunity of discovering the “next big thing” in a back-alley or black-box venue during what is still the single largest, multi-arts festival in the US. So hie thee down to 45 Bleecker Street and grab yourself a festival guide. It’s Fringing time! For on-the-go Fringe info, follow Nicole on Twitter @enkohl!